Hi! I’m Dennis and I’ve been working at Linkbal as a software engineer since October 2017. In Part 1, we took a quick look at Jekyll and how to create and deploy a website to GitHub Pages. In this second and final part, let’s explore some of the customization features Jekyll provides us. While the markdown file provides the content of a page, the structure and appearance are defined in the layout file. We can create our own layout files, but because we are using an existing theme, we can customize the theme’s layout files instead. First, let’s copy the layout files from the theme’s folder to our project (the specific folder to copy from will probably be different for you as it depends on the version of the packages installed). It is an ordinary HTML file, but we can see a couple of the features provided by Jekyll and the Liquid template language it uses. We can see that a layout itself can use another layout and that this layout can be used to display an article with a title in the top. Now, we can also open the about.md file that ships with Jekyll. We can see in the front matter that this file uses the page layout. Now that we have an idea of how layouts work, let’s customize our website a little bit. Because the default.html layout includes the header and all other layouts uses the default layout, it is obvious that all pages in our website includes the content in header.html. This include file is responsible for displaying the website header and shows many variables that Jekyll make available for us, as well as filters provided by the Liquid template language. The line above, for example, shows the site.pages variable. It is an array of Jekyll’s Page variables (you can check the list of attributes a Page variable contains in Page Variables). Any .html or .md file in the root folder or a new subfolder that contains a front matter will be part of the site.pages variable. Then, we execute Liquid’s map filter on the site.pages to get an array of the paths of those pages. The next line creates a variable called page_paths. It is assigned the value in site.header_pages, but can also be assigned the value in default_paths in the case the former does not exist, what is possible with the use of Liquid’s default filter. We are going to come back to site.header_pages later. This last snippet iterates over the page_paths variable created before and creates a link in the header for each page that has a title (defined in the front matter). You will notice the change will not be reflected immediately and will require the server to be restarted. After that, the header will look as expected. Now, we are going to explore Collections that are a great way to group related content. Let’s use this feature to implement the “Notes” section in our website. A **formatted** line of *text*. I added the styles directly in the layout, to keep things simple, as that is not the main focus of the article. As Jekyll has built-in support for Sass, please refer to the Docs to know how to manage your stylesheets. You can see we were able to access our notes through the site.notes variable and even use a custom variable background we added to the front matter. Restart the server and we can now access those notes in the /notes/ path. The files we created in the _notes folder does not generate corresponding files in Jekyll’s build process. If you need, you can change this behavior as shown in Add content. This would generate files such as /_notes/note1.html in the build output. In our example, we could, for example, display only part of the content of the notes in the list and link each note to a page where the user can see their whole content. In this final section, we are going to take a quick look at Data Files. It allows us to create files with custom data to be used in our templates. Those can be YAML, JSON, or CSV files. Let’s do an example to illustrate its use. As we could see, we can use Data Files to remove repetition in our pages by separating data and configuration. A practical use is illustrate in Navigation where it is used to create custom navigation for a website. In these article, we could learn and practice basic Jekyll concepts such as Layouts, Collections and Data Files. There are plenty of content was not covered in the articles, so I highly recommend reading the documentation, as it is very well written and easy to understand. In this second part on the series (Part 1 here), we are going to take a deeper look on application manifests and start talking about service workers. A line like the below, mentioned before, is used activate the application manifest. If the application is accessed by unsupported browsers, this line will simply be ignored, so the app can still be used without problems. The current state of browser support for the web app manifest can be found at Web App Manifest – Can I Use. For the remaining of this series of articles, I prepared a very basic project that can be used to practice what was learned. At this point, it has the minimum we need to start building upon: the main screen with an example journal entry and a button that opens a modal to add new entries, navigation and a help page. Also, the project already contains a web app manifest. You can find the project in the link below and the only requirement is to have Node.js installed. This will install the http-server package and start the development server. You can open the application by accessing the address that the server outputs and you can probably access http://localhost:8080 by default. This section should display errors and warnings in the case of issues with the manifest.json file. During the development process, we will probably want to test the app on an actual device. This way, we can add a shortcut to the app on the device’s homescreen, for example. But, instead of a real device, we can use the Android emulator that comes with Android Studio. We are not going to cover the installation of Android Studio, but it should be straightforward to install it with the default options. After starting Android Studio, we want to start a virtual device to test our application. Unfortunately, it is only possible to do that within a project. So, we need create a new project and it is OK to do that using the default settings. With a new project opened, we can access the virtual devices manager by selecting “Tools” > “AVD Manager” or by clicking the “AVD Manager” icon in the toolbar. After that, it is necessary to create a new virtual device and the article Create and manage virtual devices explains how to do so. Preferably, we want to use a virtual device with the most recent version of Android, as it should contain a quite recent version of Chrome installed, so we don’t need to install a more recent version of it manually. After creating and starting the virtual device, let’s open Chrome. To access our application, we need to type http://10.0.2.2:8080 in the address bar. This is the address that is mapped to the localhost in the virtual device. From there, we can use the “Add to Home screen” on Chrome to add a shortcut in our device. Now, it is time to work on service workers, the most important piece that makes an app a PWA. We already introduced the subject in Part 1, but we are going to go much deeper in the subject from now on. Fetch – service workers can listen to fetch events, that are triggered every time a resource (an image file or a CSS file, for example) needed by the page is requested to the server by the browser. Thanks to the fetch event, service workers can intercept and manipulate those network requests, blocking them or returning cached assets, for example. Push Notifications – service workers can listen to push notification events even if the application is already close, helping bringing the users back to the application by showing useful notifications on their phones, for example. We can also react to the user interaction to those notifications through service workers, allowing us to program what happens when the user taps a push notification on their devices. Background Synchronization – on a situation of unstable internet access, we can schedule a user action to be synced to the remote server once the internet connection is re-established. This task can be performed by the service worker once it receives an event indicating the connection is back. Lifecycle Events – as we are going to see in the next section, we can program certain actions to be executed during the lifecycle of a service worker. Registering a service worker will cause the browser to start the service worker install step in the background . This triggers the install event, when we have the opportunity to cache some static assets. Also part of the registration process is the service worker activation, that triggers the activate event, when we can cleanup resources used in previous versions of a service worker script . Once it is activated, the service worker transitions to an idle state, when it is ready to handle functional events. Because the code for the service worker registration runs in the main thread, it is run every time the application reloads. But, it is not the case for the installation process, as it is only run again if the service worker code changes. Finally, when not in use, service workers are terminated what does not mean they are uninstalled, as they are automatically re-enabled when an event is triggered. As we can check in Is service worker ready?, browser support is already very good. According to Can I use…, browser support currently covers more than 89% of the users. Now, it’s time to register a service worker for the demo app mentioned before. So, we are going to create a new file called sw.js, although it can have any name we want. Before implementing our service worker, let’s register it in our app.js file. Because we don’t know which page the user will access first, it is important to guarantee that the code to register the service worker run in all pages of our application. We can do so by executing the registration process in the app.js file because it is imported in both the main index.html and the help page index.html. In the code above, we are checking if the browser supports service workers to avoid trying to run code that will not work. After that check, we are asking the browser to register the /sw.js file as a background process. Now, let’s start the development server if it’s not started already and refresh our application. The console in the Dev Tools should output Service worker registered as expected. We can also check the “Service Worker” section in the “Application” tab, where it show that our service worker is activated and running. The line return self.clients.claim() ensures the service worker is activated correctly. It may become unnecessary in the future, but for now this helps make the registration process more robust. Now, let’s refresh our application and we will see that the registration and installation console.log() are displayed in the “Console”, but the activation output is not shown. This is expected behavior and, if we take a look at the “Application” tab in “Chrome Dev Tools”, we can see that our service worker shows a “waiting to activate” state. When your application is already open, service workers will be installed but not activated. The reason is: the application may still be interacting with the old service worker and activating a new version of the service worker which may contain breaking changes, can make the application misbehave. Therefore, we can make our service worker activate by closing the application (all the tabs/windows running the application) and reopening it. As the last step in this article, let’s write an event handler to deal with the “Fetch” event, that is triggered whenever an asset is needed by the application. The method e.respondWith allow us to customize how to respond to each fetch event. For now, it was just placed here to call attention to it as we are not doing any manipulation. This is it for now. In the next article, we will introduce caching with service workers. As you can notice by reading articles such as Seriously, though. What is a progressive web app?, it is very difficult to describe what a PWA actually is, but I will give it a try. It’s difficult to define PWAs as there is not a single specific criteria to consider an app a PWA, so it is even more difficult (if not impossible) to call an app a “perfect” PWA. Because some of the recommended enhancements rely on modern web browser capabilities and new capabilities will surely create new recommended enhancements in the future, I believe it is not absurd to consider the goal of a “perfect” PWA unattainable. Not only that, but depending on the nature of your application, implementing some of the enhancements proposed for PWAs may not even make sense. The first criteria is quite straightforward and we will cover the other two later. I’m not sure if it’s completely accurate to consider an app a PWA once these three criterias are satisfied, but I like to think so, as it gives us an objective way to make this judgement. Even after we can call our app a Progressie Web App, we will always be striving to reach the goals proposed for PWAs, such as making our apps more reliable, faster and more engaging . Now that we have an idea of what Progressive Web Apps are, let’s take a look at their core building blocks, or the core techniques and technologies we need to use to build a PWA. Service workers can intercept network requests and cache those requests to improve performance. This cache can then also be used to provide offline access when the network is not available . Because a service worker is not blocking, synchronous XHR and localStorage cannot be used. Service workers can’t access the DOM directly, so they need to use a messaging system to communicate with the page. As they can intercept network requests and modify responses, service workers only run over HTTPS to prevent “man-in-the-middle” attacks. Service workers become idle when not in use and restart when needed. An application manifest makes it possible for a web application to be added to mobile device homescreens. It is a simple JSON file that also describes how it should behave when “installed”. Among other things, it specifies the icon to be used, the URL to access when the app is launched and the background color of the splash screen displayed while the app is loading. At this point, responsive web design is a topic that does not need introduction, but it can be considered a core bulding block of PWAs because one of the goals is to create an application that fits any form factor . There’s one important confusion that is frequently seen regarding SPAs and PWAs, that the techniques and technologies to progressively enhance web applications to turn them into PWAs can only be applied to single page applications. The reality is that any web application can become a progressive web app no matter it is a SPA or a traditional multiple pages application. An application manifest is a JSON file that describes how a web app should behave once it is “installed” in the user’s device. For example, the browser uses that information to determine the icon to display when the application is added to the device’s homescreen. name: specifies a long name for the app, displayed in the app install prompt, for example. short_name: short name for the app that may be used, for example, in a device homescreen where there is insufficient space to display the full name. start_url: URL that is loaded when the app is launched through the icon added to the homescreen. scope: determines the pages the application manifest applies to. “.” applies to all pages. display: defines the preferred display mode for the website . Using standalone will make the app look and feel like a standalone app, for example. background_color: sets the background color used in the splashscreen displayed while the app is loading. theme_color: this color is shown, for example, in the browser toolbar and in the top bar on Android’s task switcher, what increases the sense of OS integration even more. description: this field is used whenever the browser needs some description for an app. dir: specifies the text direction for name, short_name and description. lang: together with lang, it helps to display right-to-left languages. orientation: sets the default orientation, but bear in mind users prefer selecting the orientation themselves. icons: icons to be displayed in the homescreen. Multiple icons with different sizes can be provided in the array and the browser will determine the “best” icon depending on the device. related_applications: array of native applications that can be installed through the applications stores of the respective platforms. In this first part of the series about the course on PWAs I am taking on Udemy, I tried to define what Progressive Web apps are, presented their building blocks and an introduction to application manifests. In the next part, we are going to go deeper into the subject of application manifests and start talking about service workers. Hi! I’m Dennis and I’ve been working at Linkbal as a software engineer since October 2017. In Part 1 of this article, I will introduce Jekyll and show how to create a new website and make it available publicly. Jekyll is an open-source static site generator. Its GitHub repository README shows a very simple description: “Think of it like a file-based CMS, without all the complexity.” With Jekyll, we can create our website structure using HTML, CSS and Liquid Templates. After the structure is in place, we can focus on updating the website’s content, by just creating files using Markdown. It is an intermediate solution that sits between static websites and web applications. We can add a little bit of dynamic behavior when generating the website but, in the end, it is served as a completely static website. Jekyll is also the engine behind GitHub Pages, which can be used to host websites from GitHub repositories. Because we are not dealing with a database, updating a website is a matter of editing files and pushing the changes to GitHub, This article is an introduction on how to work with Jekyll to create a website and how to host it on GitHub Pages. Our final goal is to have our website hosted on GitHub Pages. To achieve this, we need to upload our Jekyll project to a GitHub repository. We can have a exclusive repository for our website, but we can also store our project source in a folder of an existing repository. This last option is particularly useful for creating documentation websites for open-source software projects as it allows us to manage both the project and its documentation sources as a single project, making it easier to keep the later updated. In this article, I won’t cover Jekyll’s installation process. It is very well documented in the Jekyll documentation and I assume you are going to follow that, but I will try to present some guidelines. I also assume you have a working Git installation. Jekyll is distributed as a Ruby Gem and can be installed on most systems. It is recommended to work on a Unix-based system such as macOS or Linux, but you should not have problems working on Windows as well. By the way, this article was written on a Windows machine with Windows Subsystem for Linux enabled. You can take a look at the official documentation if you choose to go this path too. We passed the option --skip-bundle because we don’t want to install our dependencies system-wide. Instead, we want the installation of our dependencies to be limited to our project. But first, as we know we are going to host our website on GitHub, we want to setup up our project accordingly. First, open the Gemfile file created on your project’s root folder. This way the website will automatically build and reload each time changes are saved. This is particularly useful when we are writing articles and want to see how it is looking. You can stop the jekyll process at any time by pressing “Cmd (Ctrl) + C”. In this article, I will show you some examples on how we can start customizing our website. Although we can start our website from scratch, without a theme at all, it is probably easier to have a starting point, at least when using Jekyll for the first time. But, before that, let’s add our website to GitHub to manage the changes in our website. You will see that, in the case of a Jekyll website, adding the project to GitHub not only means that we are controlling its versions, but also means that we are deploying our website for public access. To start the deployment process, let’s first enable GitHub Pages. To do so, access the settings of your repository and scroll to the GitHub Pages section. Let’s change the Source option from “None” to “master branch”. By doing that, GitHub will run Jekyll to build the website and serve it whenever we push changes to the master branch. You can now access your website at the URL provided by GitHub. In my case, it is: https://denakitan.github.io/jekyll_website/. If you still can’t see your website, it may take some time for GitHub to build it. Now that we have a website running, we can create our first blog post. To do so, add a new file to the _posts folder. I will name it “2019-02-28-my-first-post.markdown”. You should be able to see the new posted listed in the home page and access its content. In this article we could see how to create a new Jekyll website and make it available for the public. In the part 2 of the series, I am going to show some examples on how we can use some of Jekyll’s features to customize our website structure. In this article, we are going to create a new ActionMailer delivery method that works with SendGrid through its Web API and integrate it to a simple Rails project created with scaffolding. This post assumes you are already have some familiarity with Ruby on Rails. When searching for information about how to integrate Rails projects to SendGrid, we are usually presented with articles that describe how to do it through SMTP. That is the case even in SendGrid’s own Knowledge Center. This is the easiest implementation for sure as it requires very little setup. But, what if we want to use SendGrid’s Web API instead? Well, there’s no official plug&play option as is the case for other services, such as Postmark. There are unofficial options, such as this gem, but they are not much popular and sometimes we just want a simpler email delivery implementation. In this case, we can create our own implementation to customize ActionMailer to use SendGrid’s Web API. 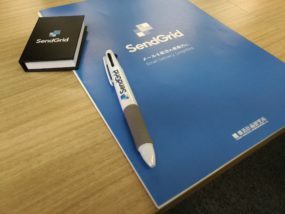 To use SendGrid’s API, we need to create a new SendGrid account if we don’t have one (there’s a free trial period and, after that, we can send up to 100 emails a day for testing purposes) and create a new API key (it’s good practice to remove API keys when they are not needed anymore). It will be used for authentication and authorization when using the API. In the SendGrid dashboard, go to Settings > API Keys and click the “Create API Key” button. Give it any name you want and choose the “Restricted Access” option, so we can customize the access level for the key. For this guide, it should be enough to set “Mail Send” to “Full Access”, as shown below. Confirm and the key will be displayed to you. It is just displayed once for security reasons and the page recommends us to save it somewhere safe. To make this permanent, add the line above to .bash_profile if you are on a Mac or to .bashrc if on Linux. This was kept as simple as possible as this is not an article on how to use the official Ruby API library. It only supports text emails and does not support cc, bcc or attachments. You can take a look at the sendgrid-ruby repository for details on how to implement the missing features, especially this example file. We need to run some intialization code to make our new delivery method available to our application. To do so, add the code below to config/application.rb file. And access http://localhost:3000/contacts to create a new contact. Fill the form and make sure to provide a valid email address you can access. You should receive a thanks email if the contact is saved without errors. You can monitor the emails sent by your SendGrid account by accessing the “Activity” menu in the service dashboard.